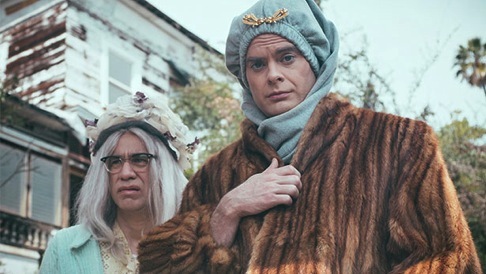 Initially showing Bill Hader and Fred Armisen in drag perhaps proved to be an irresistible promotional opportunity. The better news: Two subsequent half-hour episodes available for review are incrementally funnier than the first one, with “Kunuk Uncovered” a fully realized howl drawn from 1922’s Nanook of the North and featuring a guest appearance by John Slattery. Hader and Armisen are the on-camera principals, with main writer Seth Meyers unseen so far -- or so far as I can tell. Helen Mirren serves as host, lending a mostly straight-ahead gravitas to what’s supposed to be the 50th distinguished year of Documentary Now! Season 1 has six episodes, with skewed looks at The Thin Blue Line and History of the Eagles (a two-parter) coming later. Episode 5, “A Town, A Gangster, A Festival,” is Armisen’s completely made up salute to Arborg, Iceland and its annual Al Capone festivities. A grateful IFC already has ordered two more seasons, further underscoring the joys of working for a still smallish cable network. The “Sandy Passage” opener revisits the 1975 documentary by brothers Albert and David Maysles. They trained their cinema verite cameras on reclusive Big and Little Edie Beale, an upper class mother and daughter who had holed up in their badly decaying East Hampton, NY Grey Gardens estate. They otherwise live with two cats and a raccoon, with filmmakers Larry and Alfred Fein becoming increasingly bored and then scared. It’s fun watching Hader in various headdresses while Armisen remains very adept at looking haggard. Little Vivvy showing off her dancing skills (while waving a miniature American flag) and Big Vivvy groaning out “Pitter Patter” also are grin-worthy. But this particular mockumentary peters out before its forced conclusion. The Aug. 27th episode, a lampooning of HBO’s Vice investigative documentary series, is subtitled “Dronez: The Hunt for El Chingon.” Jack Black guests as Jamison Friend, who presides from command central while correspondents seek to locate and interview Ciudad Juarez’s reigning drug kingpin. Let’s just say that bad things to Dronez investigators John Sachs and Kyle Riley, and then to Trevor Kenney and Bryce Bowen. But an A-team of Lars Klegg and Denver McGiver is fated to make a little progress. All of the roles are played by Hader and Armisen, who probably are having more fun than the law should allow. The overall solemnity cloaking these proceedings is palpably funny, with Black doing a solid as the out-of-harm’s-way orchestrator. Then comes “Kunuk Uncovered” (Sept. 3rd), a parody of the 1922 black-and-white silent film by Robert J. Flaherty. In the mashup, guest star Slattery plays director William H. Sebastian and Armisen is the inept but increasingly demanding eskimo Kunuk (real name “Pipilok”). Armisen is fall-down funny here, whether he’s merely falling down or happily grinning and waving at the camera. Among the “current-day” interviewees is Marie Claudette, ID’d in print as ”former Eskimo whore” for the purposes of her reminiscences. It helps to have at least a passing familiarity with the documentary films being spoofed. But very few have seen the ancient Nanook of the North, and in this case it really matters not. “Kunuk Uncovered,” which -- no joke -- was filmed in Iceland, is easily goofy enough to stand completely on its own. Hader, Armisen and Meyers, old mates from Saturday Night Live, will have ample fertile territory for future seasons. Pick any Michael Moore documentary and get crazy with it. Throw The Jinx into the mix. Let ‘er rip with 20 Feet From Stardom or one of Frederick Wiseman’s “observational” treatises on hospitals, high schools, boxing gyms, etc. Not everything lands squarely on target in the first three half-hours of Documentary Now!. But there are enough moments -- and quite a lot of them in Episode 3 -- to keep this ambitious enterprise on track and well worth a roll ‘em.